Hi everyone , I hope you had a great Christmas break! I had some lovely, very busy days with friends and family. This year our presents were primarily handmade but I didn’t manage to take any good pictures and now they’ve all disappeared to their new homes. In contrast to some other years, I really enjoyed the process. We started making presents already in November, and had enough time to finish all of them without too much stress. Noelle Swimsuit: My favourite project this year was this swimsuit. The combination of the self-designed fabric and the modern cut of the Noelle pattern, just work so well together. Even though this was my first swimsuit ever, the construction went really well, and I learned a lot of new skills during the project. It’s really unique and got lots of compliments. It’s just a shame that I have to wait until next summer to wear it again. 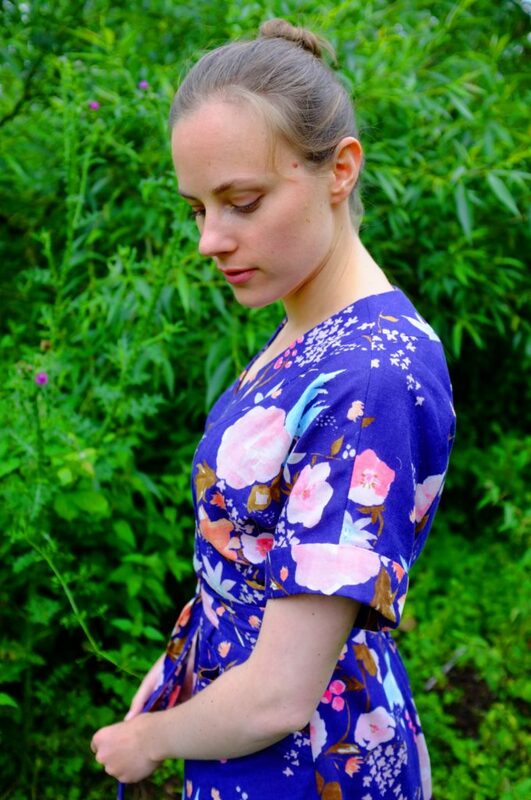 Tea House Dress: I had been obsessed with this Nani Iro fabric for ages, and all the wedding invitations this summer meant that I had a good reason for making a new, pretty dress. The shape of the dress is very flattering and it was very comfortable to wear, even through the hottest summer weddings. The dress has so many gorgeous details (big pockets, sash, kimono sleeves) that make it an interesting garment to sew and wear. I’m tempted to make another one maybe in a solid colour and more drapey fabric for a different look. Liberty Print Blouse: This blouse was quite an unexpected hit in my work wardrobe this year. When I picked up this Liberty print at Shaukat in London, I was really unsure what to make with it. I loved the print on its own, but couldn’t picture it as a garment. Now in combination with this blouse (copied from a rtw garment) I absolutely love it. It makes me smile when I put it on and brightens up my work wardrobe. 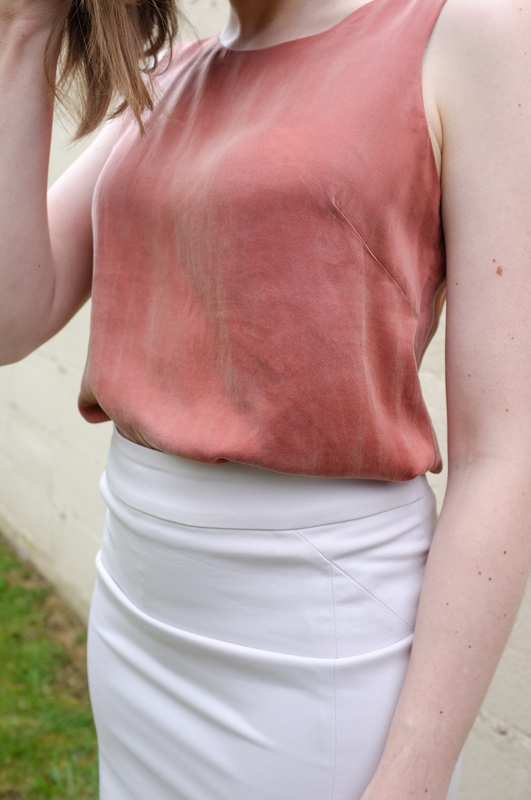 Sand-washed Silk Top: On my first trip to Goldhawk Road I fell in love with this rust-coloured sand-washed silk. It’s the most gorgeous colour and it feels amazing. 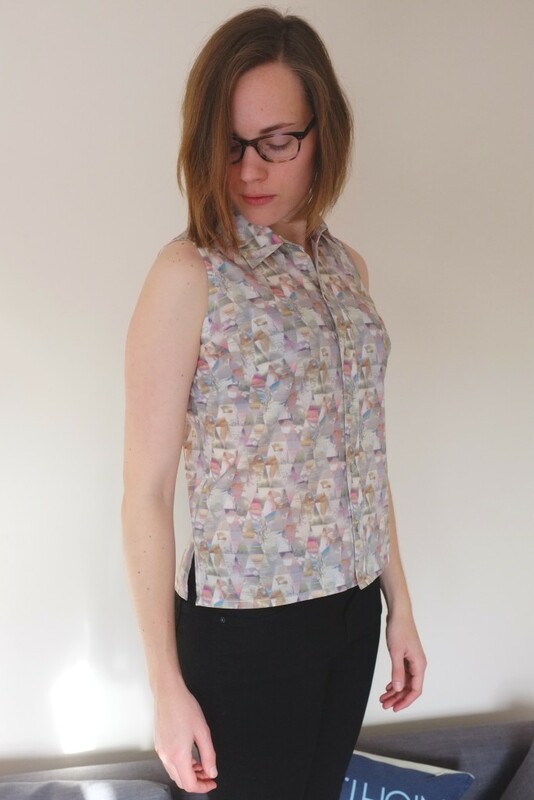 I combined it with the simple Shell Top from the GBSB Fashion with Fabric book and they are perfect together. It’s a great top for work, it works well under a blazer and tucked into skirts. I love it so much that I bought the same fabric in a lovely teal colour to make another one. Checked shirt for him: while I occasionally do some selfless sewing, this shirt was the first real garment that I made for my boyfriend. I love making shirts and this one came together without any problems. Even the fit was pretty good right from the package (I will shorten the sleeves next time though). This double sided fabric was fun to work with, as I used the smaller scale pattern for subtle contrasts at the button band, cuffs and undercollar. The bonus when sewing for your boyfriend: he is well dressed and you can look at your creations. This was a year of very few misses. I have learned to take my time to construct garments and also to figure out what I actually need in my wardrobe. So instead of 5 misses there are only two and even those are not disastrous makes by any means. 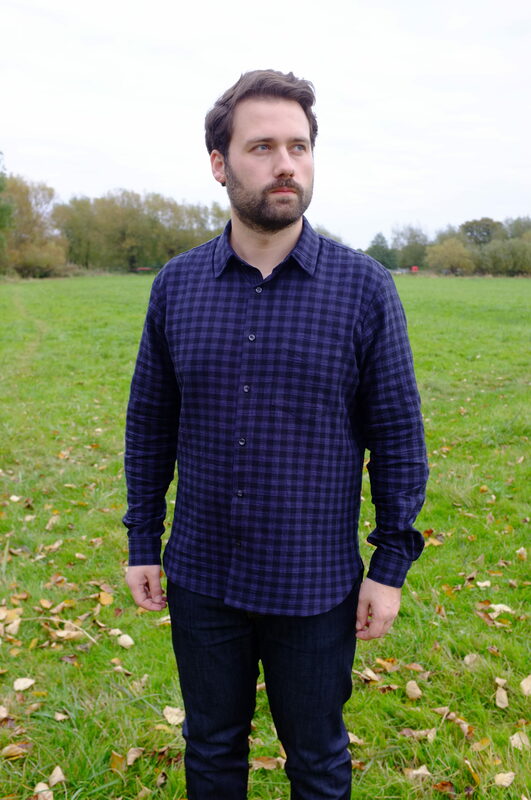 Granville Shirt: This shirt in theory should be a wardrobe staple, it fits and is well made. Still when I dress for work I never reach for it. It’s something about this navy fabric that makes this shirt look very outdated. The texture of this Japanese shirting is gorgeous up close but from afar it just looks like a stripe. In the end it just doesn’t feel very modern and will probably end up in the charity shop. Self-drafted high neck top: The issue here is really the fabric, it’s a weird linen/polyester blend, that is just difficult to work with. This is already the second top I tried to make from this fabric and again I’m not really in love with the result. It didn’t help that the pattern that I used just didn’t fit very well. The many iterations combined with the impatience that I always seem to develop when working with cheap fabrics, led to a garment that is OK to wear but could fit better. The fabric also seems to be too stiff for the gathers and in general I am not sure about the peplum shape. All in all an experiment in new-to-me shapes that just didn’t convince. 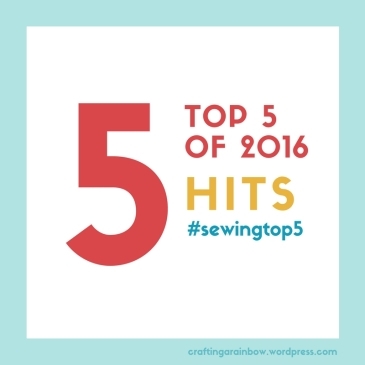 So, this was 2016, sewing-wise an exciting and successful year. Can’t wait to see how the next year will go, I have some big projects planned. I wish you all a very creative 2017! It’s been almost 2 years since I made my first two pairs of Ginger Jeans. They both are still going strong and are in heavy rotation. I’ve really enjoyed the jeans-making process and absolutely love the pattern, so I was just waiting for an excuse to make another pair. I didn’t really need another pair of blue jeans (the three pairs I own are more than enough) but I’ve been looking for a simple black pair of jeans for ages. I work in a business casual work environment, and can get away with wearing jeans if they are black. So far I’ve bought them in the shops, instead of making them, as black jeans seemed quite a boring project. 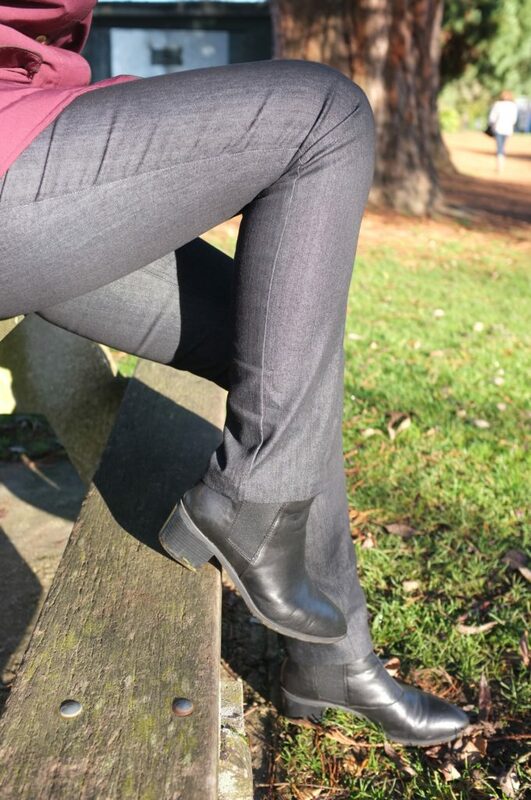 Unfortunately, the quality of the rtw jeans was not great and I’ve gone through two pairs in the last two years. It’s also difficult to find a high-waisted pair that fits me, so I finally decided to make my own. This denim that I found in the free remnant bin is not really black but more a dark grey with a stripey texture, but it looks sleek enough to wear to work. In terms of the pattern, I just worked off the amended pattern that I used for my high waisted version last time. Back then I worked off the low rise version (out of laziness and to save paper), adding 5 centimetres to the rise (3 cm at the lengthen/shorten line and 2 cm at the top). This results in a rise that is probably slightly lower than the high-rise version of the pattern, but for me it’s the perfect rise that hits at a comfortable spot. 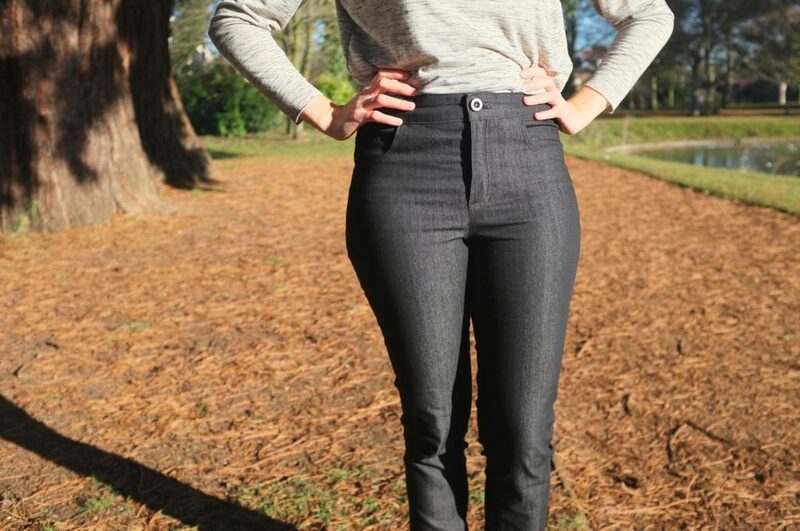 One issue I had with my high-waisted pair last time was that I used the original pocket facing pieces which resulted in the pocket facings sitting so high that they would sometimes peak out. This time I made sure to add the 2 cm to the top of the pocket facing and lining pieces. The other problem I had for my last two pairs was the waistband. Even though the original pattern piece is curved, there was still a lot of gaping at the top. 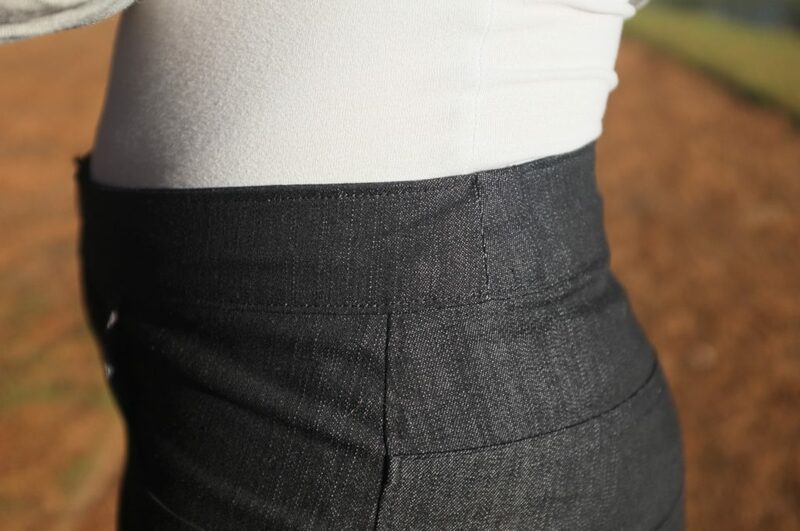 For the the low-rise pair, I drafted a waistband that was even more curved, which however, resulted in the front pieces being almost cut on the bias, which then stretched out too much. For the high-waisted pair I used the original piece again, as it was already cut (and nothing goes to waste here) and I just added darts to the final waistband. 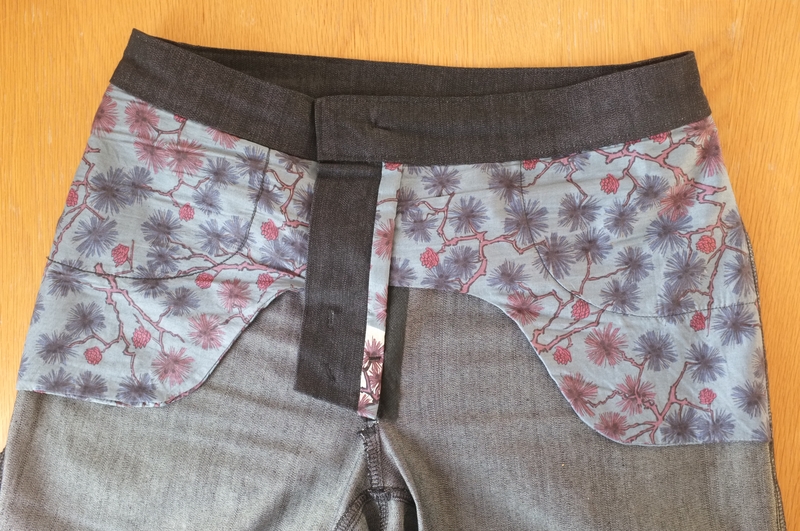 This obviously didn’t look very professional, so this time I decided to draft a proper darted waistband. I decided to add the darts slightly behind the side seam to avoid bulk. Since I decided to leave out the belt loops on this version the dart is visible, but at least the fit around the back is spot on this time. For the leg I couldn’t decide between the stovepipe and the skinny leg. 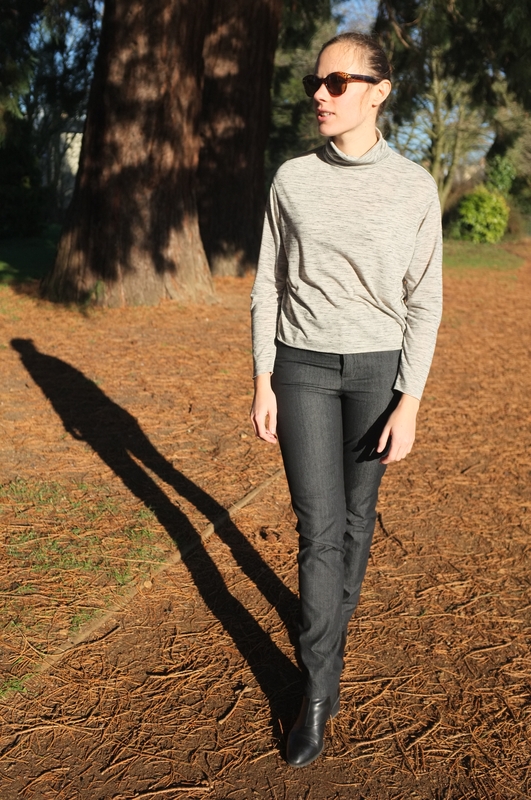 In general I find skinny leg jeans easier to style, then again the wider leg looks a little dressier. I went for the wider leg in the end, thinking that I could still narrow it at some point if I got tired of that leg shape. In terms of finishings, I went with black topstitching to keep the look clean. The only pop of colour is the pocket lining and the binding of the fly shield. I’ve had this Japan inspired print in my stash for a while now and can’t decide if I want to make an Alder shirt dress or something else. 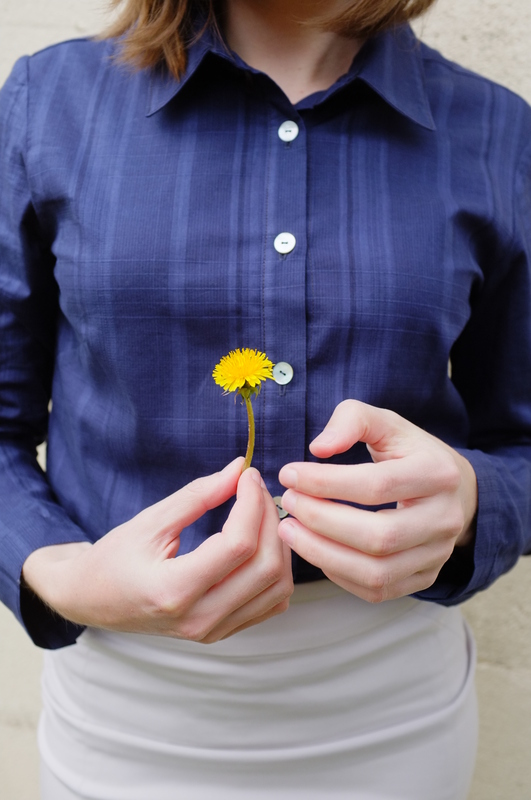 So while I decide, it makes it’s first appearance on the blog as a lining fabric. 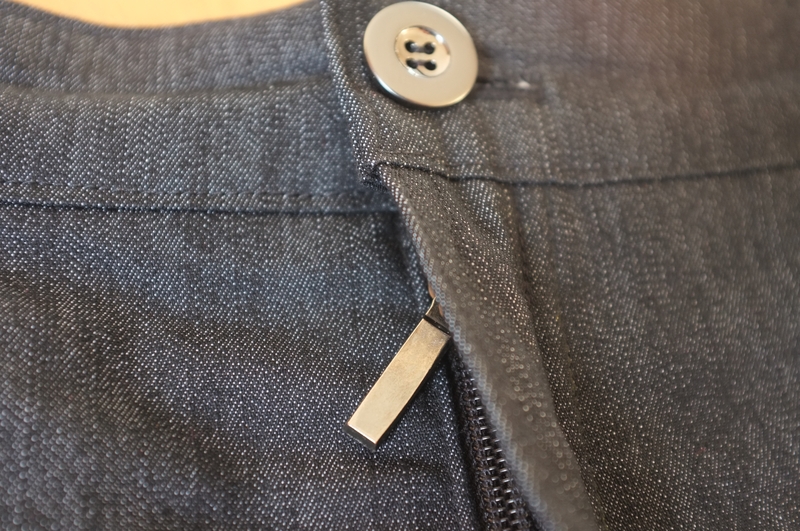 For the button I decided to forego the jeans button and go instead for a silver sew-on button that matches the zipper, which I rescued from a bag that had to go to the bin. I knew that it probably would not be the wisest idea to not use a jeans zipper (the one I used is plastic and might not hold up very well) but then again it matched the fabric so well in comparison to the one jeans-zipper I had at home. So far it’s behaving fine, so I’m hoping I can get away with it. The final jeans turned out really nice. The fit is pretty good. I might allow a little bit more room around the hips next time, as there is some pulling at the zipper and the pockets. All in all, they look good though and they are pretty comfortable. Here I have paired them with my Papercut Patterns Fall Turtleneck (blogged about here) and some ankle boots. These might not be the most interesting jeans but I am excited to add them to my work wardrobe. On cold days like we are having them in the UK right now, trousers are the only thing I feel like putting on in the mornings. These photos we took today after visiting the farmers market. It was lovely in the sun but freezing cold in the shade. For the first time this year this little pond was frozen and people were super excited smashing pieces of ice on the surface. Sometimes I forget that ongoing frost is a rarity here in the UK. The cold definitely made it feel like proper winter today and was perfect for getting in the Christmas mood. I hope you all had a lovely second advent!